With great power, comes a great number of lawsuits - and Google is certainly no stranger to finding itself in sticky litigation disputes. 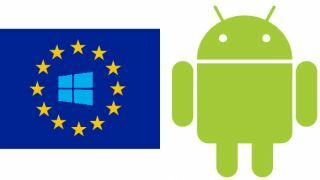 Now European antitrust regulators have received a formal complaint about Google's Android for mobile, filed by Fairsearch Europe, a group that includes Microsoft, Nokia and Oracle. According to the group, Android is giving Google anti-competitive and "deceptive" advantages, acting as a vehicle for the company to control consumer data and using its free model to give it a leg up. Can't we just talk it out? "Google is using its Android mobile operating system as a 'Trojan horse' to deceive partners, monopolise the mobile marketplace, and control consumer data." Big words, it seems. But does Fairsearch have a fighting chance here? The group's problem seems to be that, while Android is free, users must download a number of apps in order to "register" with Google. This means things like YouTube and the Google Mail app get prime position. However, registration is not mandatory. But the fact that Android is free does make it difficult for rivals to compete. "Failure to act will only embolden Google to repeat its desktop abuses of dominance as consumers increasingly turn to a mobile platform dominated by Google's Android operating system," Vinje added.